If you’re reading this there’s a good chance you’re looking to optimize your print job submission process by streamlining and automating your workflow. You’re certainly not alone, and the trend within the digital print world (especially for in-plant or central reprographic departments) is certainly heavy with automation right now. A successful print workflow automation process will increase an organization’s productivity and efficiency in how they accept, process and communicate their print orders. The advantages of applying print workflow automation into a print process are many, most of which will translate to increased efficiency within the operation and, in turn, greater profitability. 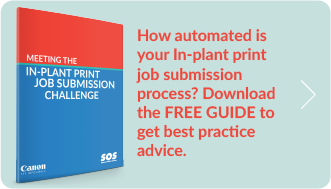 If that’s enough to peak your interest, get this guide to learn more about how Canon’s print workflow automation tools can bring value to your organization: Meeting the In-Plant Print Job Submission Challenge. However, if you’re interested in learning a little more about just what kind of value we’re talking about, here’s a more in-depth look at 11 of the most common benefits of introducing print workflow automation. Print workflow automation will reduce the turn-around time for customers, and you’ll be able to get their print job feedback faster than ever before. Automation will also make it easier for customers to submit and track orders, and print projects will make it to market quicker, in turn making your customer more successful. Print workflow automation also promotes greater communication with the customer, as well as within the print organization itself. Online templates allow for more control over the use of your company’s brand, and the organization’s supply chain will also see efficiency gains. Finally, one of the most obvious benefits is the newfound ease in reordering and reprinting existing projects. Keep an eye on this blog for more information about print job templates! While the overall organization will see efficiency gains by implementing print workflow automation, each department within the organization will, to some degree, see their own gains in efficiency. Automation and easier access to the process will also promote better communication between departments. Read on for more in depth explanations of how print workflow automation benefits various departments. Miscommunication is one of the biggest reasons businesses lose money. Email and word of mouth open the door for communication delays and misinterpretations. A solid print workflow automation tool virtually eliminates those costly miscommunications. The more automated a system is, the fewer variables there are in estimating production costs, so companies that employ print workflow automation (especially for job submission) are able to provide a job quote more quickly and accurately. This, in turn, hopefully means the customer approves the proposal faster. That results in a quicker turnaround time for delivering the job, which makes the client happy and allows the print organization to move on to new projects. Manual accounting can get expensive, and it leaves a lot of room for error given the amount of data entry, archiving, filing and retrieving files. Print workflow automation permits companies to go paperless with its job accounting. That makes it easier to retrieve data and greatly reduces the likelihood of accounting errors. This cleaner approach and virtually error-free process means that invoices can be retrieved and approved faster, once again allowing the organization to move on to more projects. While print jobs vary, print workflow automation allows a company’s brand to be consistently established across the jobs. Templates help establish a company’s brand through its unique layouts, colors and specific brand images. Templates also streamline the job creation and submission process for customers. The bigger the job, the more expensive a mistake is. Common problems, like issues with resolution and readability, are identified quickly when utilizing a print workflow automation tool. Those potential issues can then be fixed before a single letter of font is ever printed, saving the print organization the time and money associated with these types of mistakes. If a print workflow automation tool is being used, that software can normally be integrated with other software and various IT platforms. This allows print organizations to introduce enhanced quality control tools, further reducing the likelihood of costly errors. Order information can also be automatically integrated with a company’s accounting platform, making it easier to process, track and finalize orders and costs associated with each and every job. Perhaps the most obvious benefit of print workflow automation is the streamlining of the production process itself. This advantage is extremely useful for high-volume jobs and those projects that require a number of print variables. The automation speeds the workflow and you’re left with a better balanced workload. Ultimately, the print workflow automation tool allows for an organization to take on more work and do it more efficiently, all while reducing costly mistakes. As mentioned above, a print workflow automation tool impacts several areas of the business, including marketing and sales. More efficient and productive work processes means the ability to take on more work. That, in turn, will enable an organization’s sales team to launch more sales campaigns faster. We all make mistakes, and while usually forgivable, it doesn’t change the fact that mistakes can cost an organization money. The more manual a printing process is, from job submission through final delivery, the greater the likelihood there is for mistakes. Utilizing print workflow automation means that once a job is dialed in at the beginning of the operation, manual intervention is greatly reduced and the operation can roll on more efficiently and free from mistakes. All of this results in yet another boost in efficiency and productivity. The benefits of a print workflow automation are many, and the advantages vary. However, virtually all of these roads lead back to happier customers and a more efficient, productive and profitable print organization. Superior Office Systems is your resource in the NYC metro area for Canon’s print production automation solutions. Contact us to find out how your organization can reap some of these benefits.